Issaac Franklin “Frank” Hill, was born September 16, 1863, in Goshen. He was a son of Isaac and Susan Cribbs Hill, a pioneer couple who came to Goshen in the 1840’s. Frank married Miriam Alsie Jones, of Alliance and the couple had a son Howard Hill and five daughters, Amelia M. Davis, Eva Lute, Esther Haney, Dorothy Snyder and Grace Schumacher. Frank later became well-known as an herb doctor and became known as “Doc” Hill. He began making Union Salve charging 25 cents per 2 oz. container.The salve was sold throughout the United States and was also taken by missionaries to Mexico and South America. Once Frank’s business started to grow he built a small laboratory, or medicine shop, near his home along Goshen Hill Rd. Later, Frank also used herbs to make Hill’s Linament, which sold for $1.50 for a three-ounce bottle. He also produced Golden Seal stomach tonic, vapor ointment, cough syrup and a salve to treat eczema, called Death to Itch. That salve was also used to treat some skin cancers. Frank “Doc” Hill died in 1947 at the age of 84. Several of his decendants are still making and selling the products. For a complete story and photo, see the Goshen History 2. The remainder of this page is from “Find A Grave”. “Doc” Hill was well known in Ohio for his herbal remedies during his lifetime. Thanks to his ancestors his name & remedies live on nationwide. Hill’s granddaughter Ida Nutt manufacturers, packages, & sells his remedies from Idaho all over the US using Doc IF Hill’s facsimile.”Doc” Hill is my husband’s great grandfather. In the fall of 1900, Isaac Franklin Hill was a worried man. Hill, a blacksmith at a coal mine at Wainwright, was laid up in bed, temporarily blinded after an accident at work. He doubted he’d ever be able to return to the mine, and he had a wife and a growing family to support. He had to find a way to make a living. As he lay there day after day, both eyes covered by bandages, he pondered how he could support himself and his family. Hill had always been interested in the medicinal properties of herbs, so he decided he would create a salve that he would market. This marked the beginning of the long, unconventional career of “Doc” Hill, who, over the next 47 years, developed numerous salves, ointments and liniments and treated more than 400 cancer cases. Hill was born Sept. 16, 1863, at Goshen, the son of Isaac and Susan Hill. He came from a large family, so he had to go to work in the mines at an early age. He married Marian Jones in 1886. On his birthday in 1900, Hill was working at his blacksmith shop at the mine, trying to cut off the end of a coal car axle, when a piece of a chisel he was using broke off and hit him in his left eye. Hill was taken home and doctors were called. He lost his left eye, and the doctors bandaged both eyes to prevent his right eye from being weakened by overuse. While he was recuperating, Hill came up with the idea of creating Union Salve. When he had the recipe for the ointment finished, he called in his wife to write it down, according to his daughter, the late Esther Haney. Haney recounted the story of her father to her grandson, Todd Cox, in a taped interview several years ago. Hill wanted to be sure that he had come up with a good recipe for an ointment, so he showed it to one of his physicians, Dr. Henry, when Henry made a house call. “Mr. Hill, you couldn’t have picked a better ointment,” Henry told him. 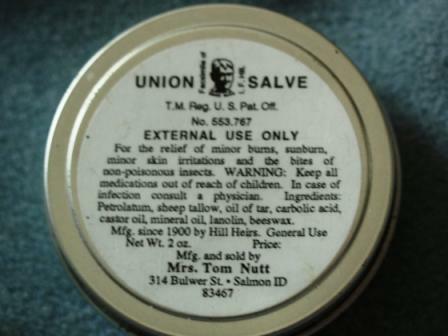 Once Hill had recovered, he began manufacturing Union Salve and then started selling it. According to his daughter, the salve sold for 25 cents for a 2-ounce box. At first, Hill marketed it just to his relatives, but soon it was being sold to people throughout the area. According to testimonials Hill received from satisfied customers, the salve was good for treating burns. As his business grew, Hill built a laboratory at his home on Goshen Hill Rd. There, he also developed a vapor ointment, a cough syrup, Golden Seal stomach tonic, and a salve to treat eczema, called “Death to Itch.” The stomach tonic sold for $1.50 for a 3-ounce bottle. Haney said her father “always had his nose in a book,” reading up on the medicinal properties of herbs while he was developing a new product. She said his salves and ointments were all his ideas. No one helped him create them. Though he didn’t have a license to practice medicine, Hill also began to treat cancer patients. His daughter said he would only treat skin cancer, never internal cancers. “He took off more than 400 cancers without a knife,” Haney said. One of his patients was a 45-year-old Canton woman who had a growth on a breast. Hill first applied his eczema salve on the growth and later put a poultice on it. The woman had to wear the poultice for weeks. Eventually, Hill was able to pull the growth, which weighed 4 pounds, away from the healthy skin, Haney said. “People had so much trust and faith in him,” Haney said of her father. She recalled that people would come to him day and night for treatment. Once, a man with a bleeding ulcer sought Hill’s help at 2 in the morning. Hill took his job seriously. Hill was known as the “herb doctor” and also the “Indian doctor.” Haney said people called him the Indian doctor because of his use of herbs. Also, because he had only one eye, people thought he looked like an Indian. “Doc” Hill died at his home at Goshen on June 23, 1947, at age 84. His descendants continue to manufacture and sell Union Salve and some of his other creations. The salve has been used by missionaries in South America and is especially popular with the Amish. It is sold at some drug stores in the area, as well as in several stores in Amish country. Hill’s granddaughter, Ida Nutt, also manufactures & sells Union Salve & White Liniment in Idaho. Just an FYI, the Union Salve is some pretty AWESOME stuff. We use it on ourselves & our pets. The Family also continues to make White Liniment, not only does it help your muscles, but it clears your sinuses too. This is one ancestor my husband really wishes he could’ve met & I agree. I bet we would have had some interesting conversations.